The March Releases Have Arrived! 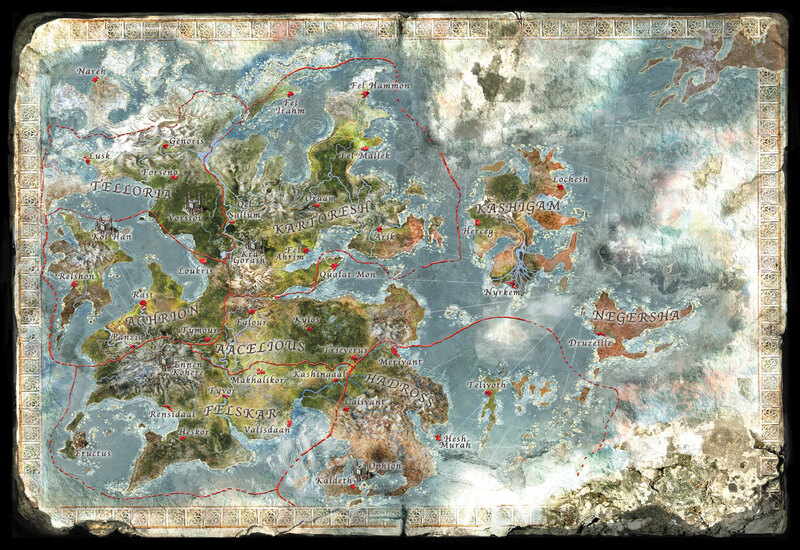 We are very excited to present the latest in Wrath of Kings greatness – the March releases! You can find them in the coolminiornot.com webstore by clicking on their titles in this post. 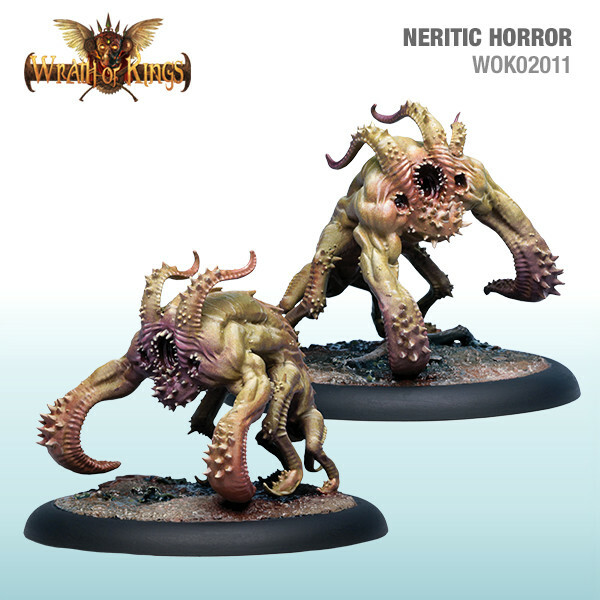 The Neritic Horrors are Rank 1 Specialists that would make a great addition to any Hadross army. The Neritic Horrors are best deployed against enemy troops that already have low Will values. The Aura they project reduces enemy Will, leaving massed troops vulnerable to the Neritic Horror’s terrifying attack – the Abyssal Screech. For centuries the leaders of Shael Han have worked in concert with the many elemental forces flowing through Achrion. The Celestial Host are the ultimate manifestation of the agreements that have been struck, powerful Celestial spirits given corporeal form. From Monkey to Bear, from Snake to Elephant, there is a Celestial warrior for almost any task. 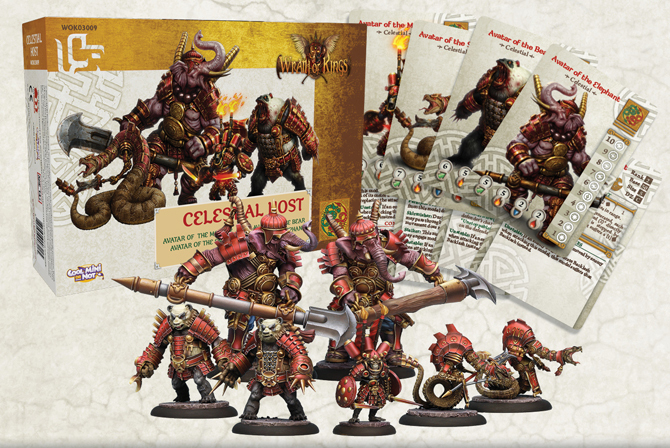 The Celestial Host is a mix of three different types of Rank 2 Infantry and a Rank 1 Leader for a Shael Han force. 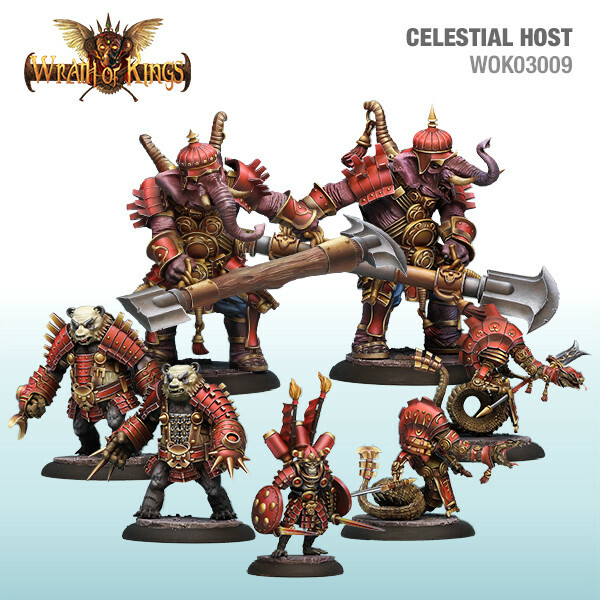 The warriors of the Celestial Host can fulfill a variety of roles on the tabletop. The Avatars of the Serpent are fast, elusive, and can strike without warning, while the Avatars of the Elephant ponderous and powerful, dangerously immovable objects if you will. The Avatars of the Bear are ferocious missiles, able to tear through a formation of massed troops, and the Avatar of the Monkey stands ready to parry incoming blows and deliver magical attacks. Boxed set contains: one (1) Avatar of the Monkey model, two (2) Avatar of the Serpent models, two (2) Avatar of the Bear models, two (2) Avatar of the Elephant models, one (1) 30mm base, four (4) 40mm bases, two (2) 50mm bases, and four (4) Wrath of Kings unit cards. We promised you more, and now we’re delivering! We have another two boxed sets for the factions of Arikania releasing today – the Character Box 3 for Nasier, and the Butchers box for Teknes. It is important to note that if you would like your local store to stock Wrath of Kings (or they already do and you want to buy these releases direct from them), and they are in the U.S./Canada, please have them contact our Sales guy, John Smith, via email – [email protected]. John will be able to get them sorted. For our UK and European fans, we are still working hard to get a UK distributor. We suggest you get your local store to contact their favorite UK-based distributor so that we can show these guys that there is a growing demand in your part of the world! Kor Kallum is a Rank 2 Character Specialist and Vallenya Rhabar is a Rank 1 Character Specialist for Nasier. 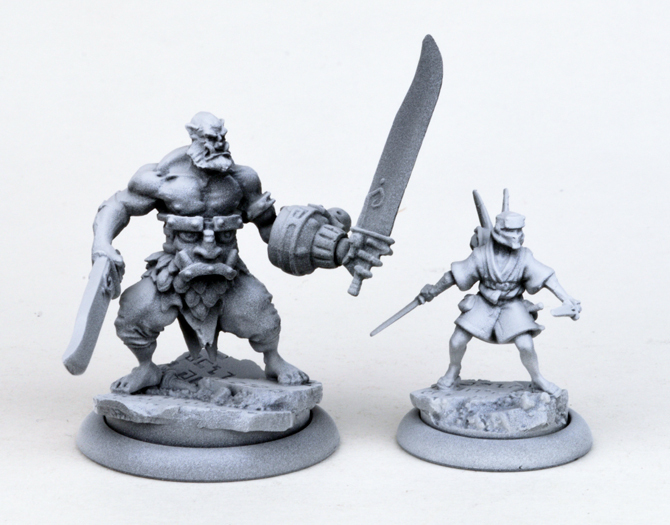 Kor Kallum is a very dominanting model on the tabletop, and has a variety of options to choose from in combat. As well as being able to roll up to 5 dice in combat, he could instead choose to keep all enemies within 6” locked in combat with your Ashmen, making him a great utility player. Vallenya moves fast, can cut through the enemy lines and start attacking from behind. Although fragile, she is the perfect assassin. 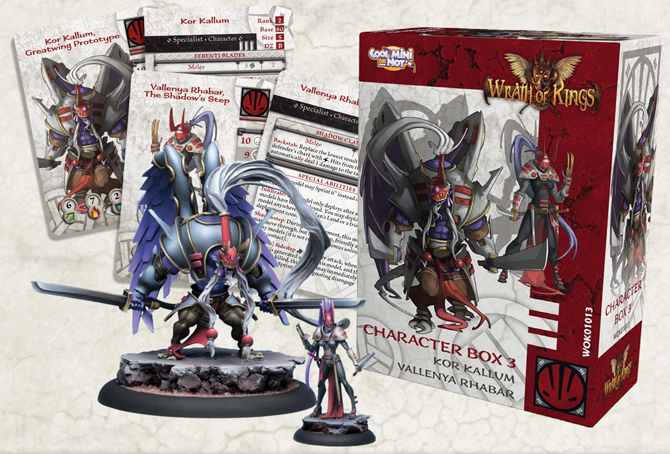 Boxed set contains: one (1) Kor Kallum model, one (1) Vallenya Rhabar model, one (1) 80mm base, one (1) 30mm base, and two (2) Wrath of Kings unit cards. 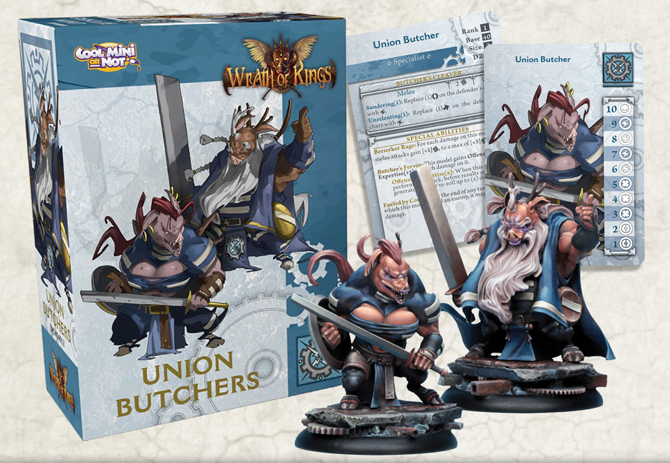 Infusing a deeper sense of rage and bloodlust in the most depraved of House Teknes’ veteran pig-men, the Union Butchers are devoted soldiers that thirst for the pain and deaths by way of their flesh-rending, bone- splintering cleaver-blades. 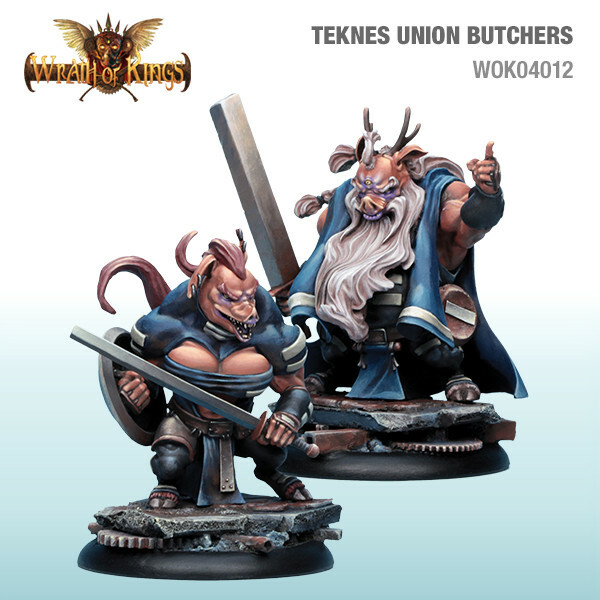 The Butchers are Rank 1 Specialists that would make a great addition to any Teknes army. The Butchers are brutal killing machines that are best placed where they might suffer a little damage before they start to cleave their way through the enemy (especially those with Armor or Dodge). They are excellent support for motivations that reward a breakthrough. 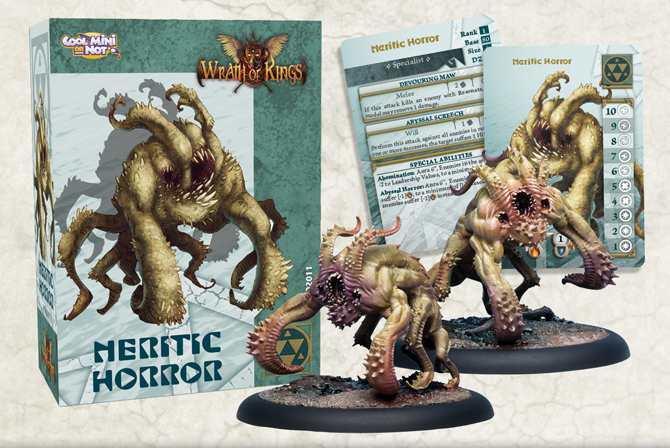 Boxed set contains: two (2) Teknes Butcher models, two (2) 40mm base, and one (1) Wrath of Kings unit card. The Celestial Gatekeepers and Tricksters have been much anticipated, the models are wonderful, and their rules make them exciting additions to Shael Han armies across Arikania. 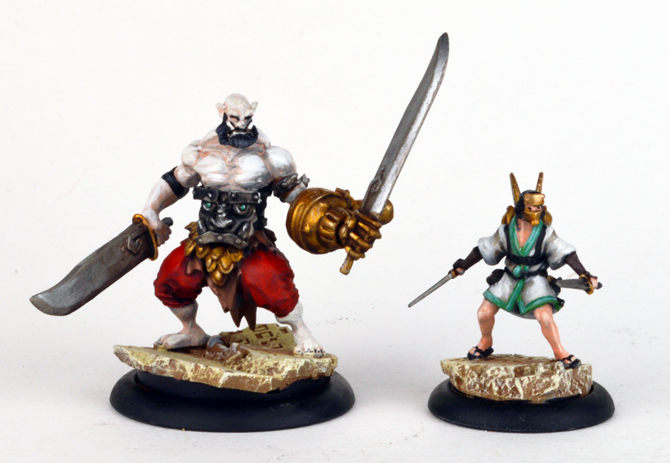 These are the first of the Shael Han units from the Wrath of Kings: Rising Conflicts book to be released. To find these releases in the CoolMiniOrNot webstore, simply click on their names in the post below. Stalwart and powerful, the Celestial Gatekeepers are tireless guardians of Shael Han’s holy places. They have been summoned to the battlefield to protect all of the House’s territories as a whole, sprinting forward blindingly fast to crush foes in their armor-shattering jaws. This box of Rank 1 Specialists are a great addition to any Shael Han force. The Celestial Gatekeepers are excellent guardians and will be best used escorting Leaders or important units to their targets. Box contains: two (2) Celestial Gatekeeper models, two (2) 50mm bases, and their Wrath of Kings unit cards. The laughing children of misdirection and malicious pranks, the Celestial Tricksters of House Shael Han use magical manipulation and illusionary influences to slay their enemies with madness and frustrating lunacy. 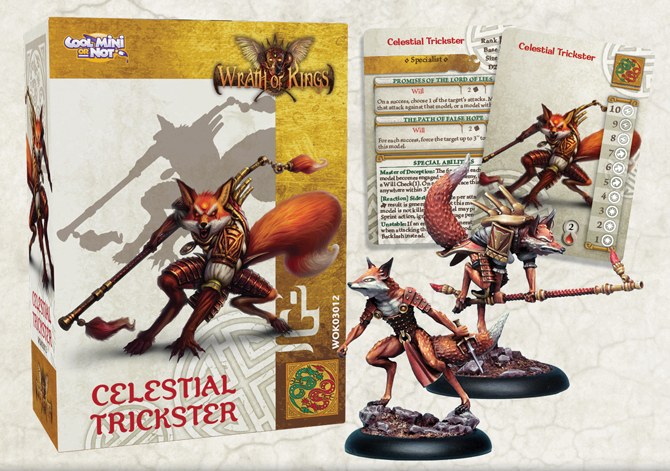 The Celestial Tricksters are maliciously mischievous and use their Will-based attacks to cause opponents to strike themselves or others, and to lead enemy models around the table against their wishes. Box contains: two (2) Celestial Trickster models, two (2) 30mm bases, and their Wrath of Kings unit cards. Well, what can we say? 2016 proved to be an incredibly tumultuous year for us as far as Wrath of Kings goes. We started out with strong plans for a great year, and in April we started to deliver on our promises. We had a burst of great releases to coincide with AdeptiCon, and these then filtered out into retailers around the world. 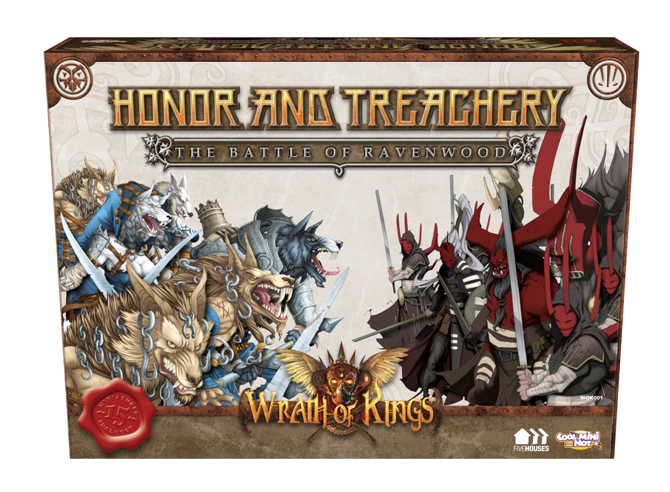 Wrath of Kings: Honor and Treachery was our first foray into a two-player starter set format. We provided two starter forces of our most popular factions (Goritsi and Nasier), quick start rules, a scenario and some 2D-punchcard terrain, all for $60. Throughout the year, this set was a good seller, very popular at all of the shows we attended. We also released the first wave of boxed sets from the (then forthcoming) Rising Conflicts book. Nasier and Teknes saw the bulk of the love, with Infantry and Specialist boxes for both, while Goritsi received some fantastic werewolf Characters. At CMON Expo in May, we made a few quite grand announcements about the future of the game and the way we’d be releasing the rest of the Rising Conflicts boxed sets over the year. We basically said that we’d release three more boxes in August, and then follow that up with two boxes each month until all the units from Rising Conflicts had been released. This was a very good plan, and we were very excited about it, but like all plans, it didn’t survive contact with reality. More on that later. 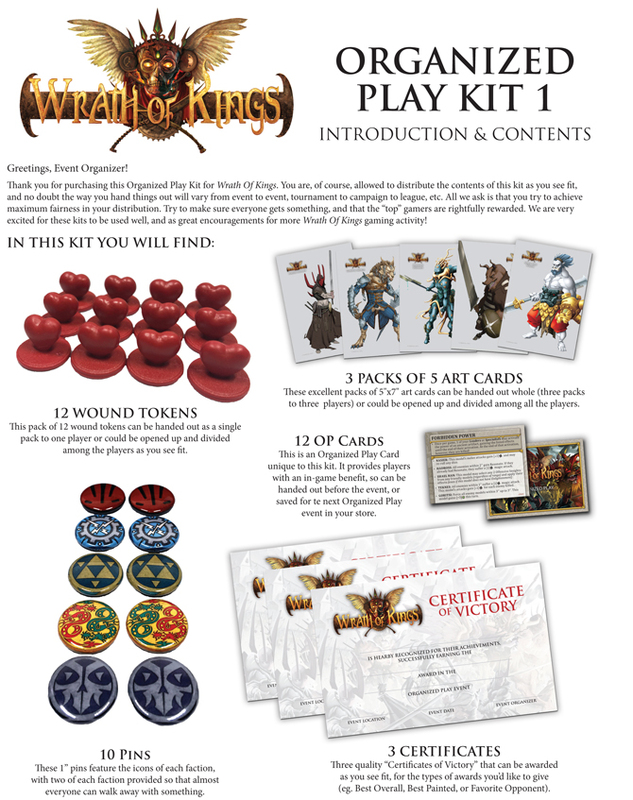 We were able to create and launch the Wrath of Kings Organized Play Kits (there’re two of them) in August, with the first prizes being handed out at GenCon. This is something that the community had been asking for, so we were excited to be able to provide it. If they do well, we’ll certainly look into doing more in the future. And that mention of GenCon leads us on to the downswing in the second half of the year. That great plan wetland about earlier? This is when a number of factors beyond our control came into play and caused numerous confusing delays for us, the product, and the excitement for you, the Wrath of Kings enthusiast! For GenCon in August we were able to airfreight in a limited number of copies of the Rising Conflicts book, the Book One Unit Cards, and the three boxes you see pictured above. These sold quickly at the show, but weren’t worried at the time, we knew our sea-freight was just around the corner. Sadly, that was not actually the case. When Hanjin Shipping collapsed it disrupted our supply lines considerably. Stock was delayed as new shipping companies were found, another was a knock on effect for our planned Q4 releases. When the above products did arrive in our warehouse, there was confusion about the new street dates that compounded the issues, and delays stacked up. Rather than try to air-freight in any number of the previously slated Q4 releases, we made the tough decision to postpone their release until we could be certain of the full amount of stock being in our warehouse. All in all, there was a great deal of wailing and gnashing of teeth. Confusion reigned and we (perhaps incorrectly) pulled back from making any announcements or promises until we knew we could achieve our goals. We thank you all for your continued patience, and we look forward to moving on in 2017. This Friday, January 13th, we have the first of the “two boxes a month” releases. Finally, the forces of Shael Han get some reinforcements in the form of the first of the Celestials. 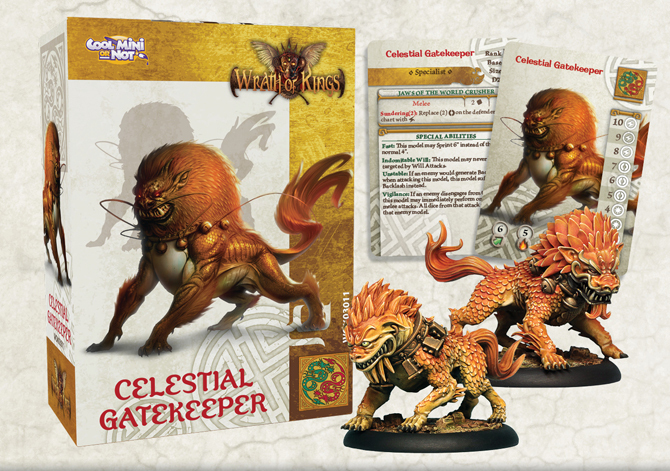 The Celestial Gatekeepers and Celestial Tricksters are both Specialist boxed sets and the first that cover the Celestial spirits that work alongside the forces of Shael Han. The Gatekeepers are fiercely dogged guardians that will not let the enemy escape once they get a hold of them. The Tricksters are capricious spirits who seek to sow as much discord as possible, tricking their opponents into striking themselves and luring them around the battlefield. 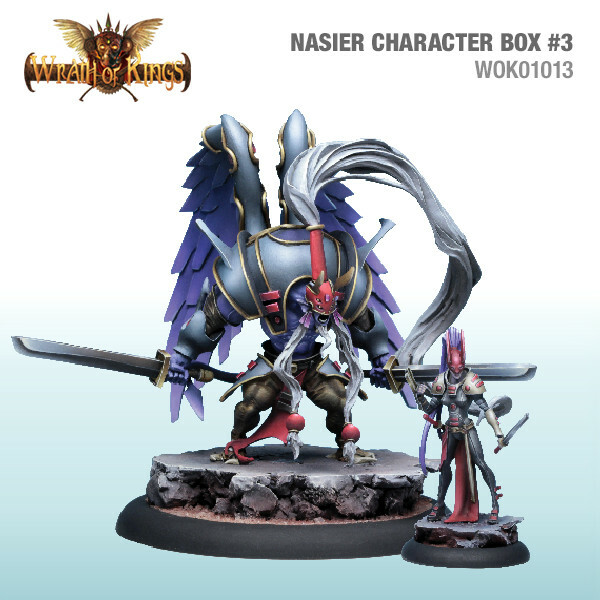 We have another two boxes that will release in February, and Nasier gets some new Characters, while Teknes gains a couple of brutal Specialists. Kor Kallum is a massive Rank 2 Specialist Character who was the prototype for the Greatwing project. He can not only fly, but also switch between a number of special abilities that buff his already solid melee attack or weaken the options of the opponents around him. Vallenya Rhabar is a Rank 1 Specialist Character who is the quintessential Nasier assassin: infiltrating, side- and shadow-stepping, and finding the weakness in her opponent’s defenses. The Butchers of House Teknes are Rank 1 Specialists focused on destruction. 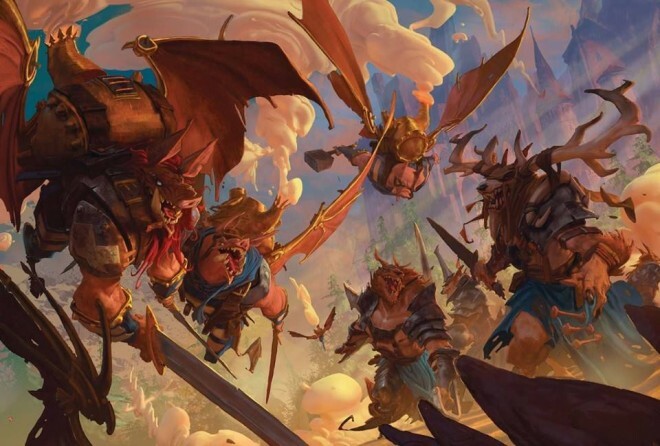 Although their attacks are quite considerable already, as these hardy warriors suffer damage their rage just adds to the carnage they leave in their wake. And then we come back around again to Hadross and Shael Han. With these releases, each faction will have received three new boxed sets from the Rising Conflicts book. The Neritic Horrors from House Hadross are literally animated collections of thousands of living corals. Herdsman Deepcallers have bound Neridian spirits into these formations to create these walking reefs. These Rank 1 Specialists cause dangerous Aura effects as they shamble across the battlefield. And perhaps one of the most anticipated boxed sets from Rising Conflicts – the Celestial Host. 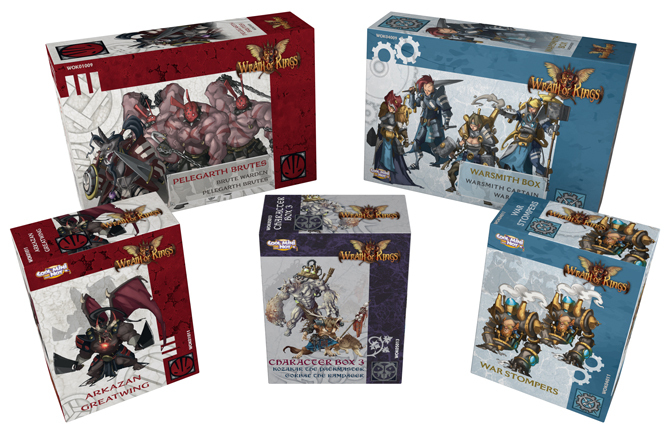 This boxed set contains the Infantry component of the Celestial forces, and includes a Rank 1 Leader (the Avatar of the Monkey) and two each of the other Rank 2 Infantry models (Avatars of the Elephant, Bear, and Snake). Each of these Celestial spirits has a different focus in battle, from entangling the enemy, to soaking up damage, to obviously tearing their opponents limb from limb. It has been a rough year for us on the Wrath of Kings team. Some things have gone incredibly well, and others spectacularly poorly. 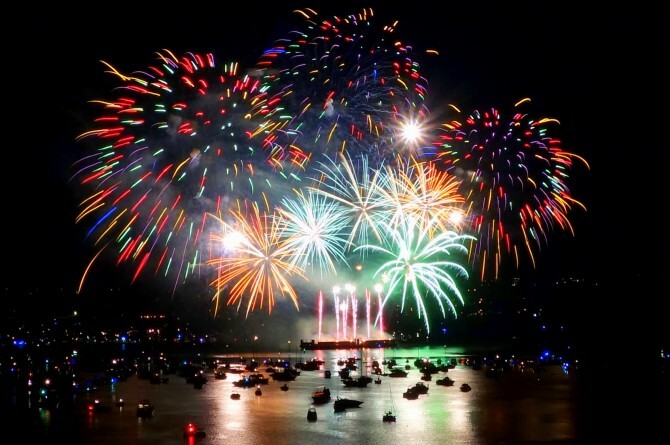 However, thanks to your constant support, we stand ready to face the new year with all we have. We look forward to continuing this journey with you. The Wrath of Kings team. Although AdeptiCon itself doesn’t roll around until March 23rd, 2017, registration and tickets sales begin next Monday! That’s right. Ay 8pm Central Standard Time in the USA, you will be able to buy your badge for the four-day long show, and sign up by all sorts of awesome gaming and hobby activities! For Wrath of Kings fans we have a number of events scheduled. These will be run in our own CoolMiniOrNot gaming area right next to the vendor area. 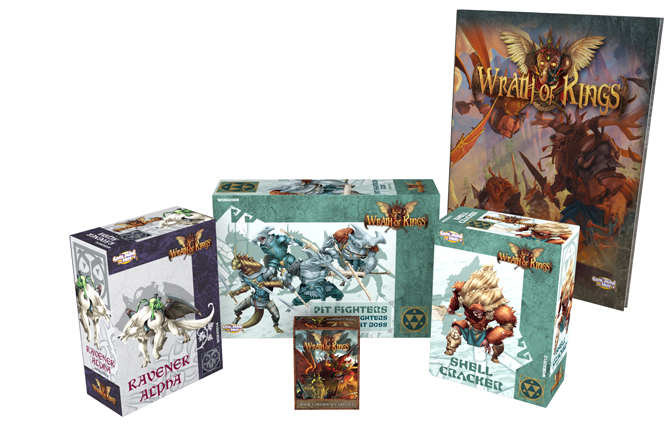 • 10am-2pm – Wrath of Kings Build & Play – Sit down with a bunch of like-minded folks, assemble your Faction Starter set (purchased at a discount) and them jump into some games of Wrath of Kings. This event is perfect for those who are introducing friends to the game, or would like to start a brand new faction. • 2-6pm – Wrath of Kings Skirmish-level Tournament – A three-round tournament where you will face off against some of the best players the Chicagoland area has to offer. Check out the tournament rules pack in our Downloads section here. There will also be a tasty prize pool! • 6-10pm – A Prelude to Ravenswood – Our first real scenario game that sees the forces of House Goritsi take on those of House Nasier. Community member Bobby Limoggio has been working hard to put this all together and we invite you to check out his hard work. Spot prizes will be handed out for heroic feats and dastardly deeds! • 12-4pm – Wrath of Kings Skirmish-level Tournament – A three-round tournament where you will face off against some of the best players the Chicagoland area has to offer. Check out the tournament rules pack in our Downloads section here. There will also be a tasty prize pool! Additionally, we’ll have times when you can just sit down and play through a few games of Wrath Kings with your friends. Although the events are not listed on the AdeptiCon site at the moment, they will be up on Monday (the AdeptiCon team have the events list) and ready for you to purchase tickets! We look forward to seeing you all there for what is one of the biggest tabletop wargaming shows in the US!